"I feel that we met in Grand Central for a reason. We were meant to find each other…" Radius-TWC has debuted a trailer for Chris Evans' feature directorial debut, a charming indie drama called Before We Go. This sweet romance follows a woman, played by Alice Eve, who misses her train home from New York to Boston and is robbed. Soon after she meets a street musician, played by Chris Evans, and together they have one of the most remarkable nights of their lives. As sappy as that seems, there's something that feels so real and honest about this, and I can't help but say I got the chills a bit watching this footage. That kind of connection, that chance meeting is so rare and so beautifully captured here. I'm looking forward to this film. A woman misses the 1:30 train from New York to Boston and a street musician spends the night trying to help her make it back home before her husband does. Throughout the night they learn a lot about one another and eventually find a romance. 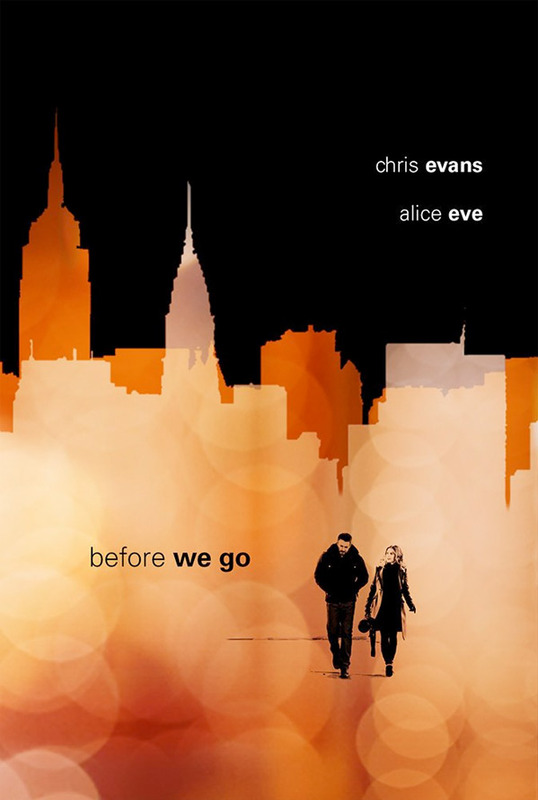 Before We Go is the feature directorial debut of actor Chris Evans, who also produces and stars in the film as well. The script is credited to Ronald Bass, Chris Shafer, Jen Smolka and Paul Vicknair. This first premiered at the Toronto Film Festival last year and also played at the Seattle Film Festival this year. Evans' Before We Go will be available on VOD starting tomorrow (on July 21st) and will also open in select theaters starting September 4th this fall. Visit the official site. Curious? There's no way a street musician would have such symmetrical facial features. I made it 20 seconds in before I couldn't stand this paint-by-numbers schlock. Wait until he sneaks a peak at those webbed toes. Just watched this... Much better than I expected. Just watched this too. Not bad. Well a lot better then what I expected. Solid performances from both leading actors. OK it's not as good of a movie as Before Sunrise, but it was a pretty good movie in it's own right, especially as a directorial debut for Chris Evans. In fact, if Before Sunrise and its sequels hadn't been made (or if I hadn't seen them first) I would've been pretty blown away by this movie. There was a lot of great dialogue, and they did a great job of not over-acting, which would be easy to try in a movie with this type of pacing. Also two thumbs up for using "I Don't" by Margot & The Nuclear So and So's during the scene in the dinner where Nick and Brooke talk about her husband...I love that song and it made a nice, soft backdrop to that conversation.